When you are restoring a period building, you will want to get all those little details right. Whether it’s a Victorian townhouse, a Georgian apartment or a traditional English Cottage you are working with, it’s the finishing touches that make all the difference to the final project. Architectural ironmongery is incredibly important to get right, as the ironwork on doors, windows and interior finishings is often the thing that catches people’s attention as they reach their hand to open a door or close a window. When you are restoring a home in a period style, spending a bit of time doing your homework into the correct styles and appearances of the ironwork in your home will pay dividends in the long run and be a worthwhile investment for your project. The use of iron in buildings for joints, hinges, railings and handles can be traced back for centuries. The skill of crafting with iron was borne out of the hardwearing and sturdy properties of the metal and can be seen in all period buildings. Old buildings are a living record of the communities that built and lived in them and the ironmongery that comes with old buildings survives as a record of the craftsmanship, skills and available materials of the period, therefore it is our duty as a modern society to try and retain as many of these period features as possible. Pre Georgian houses dating back to around the 15th and 16th century tend not to have their original ironmongery in place, largely because many of these buildings will have fallen into disrepair at some point in the past and will have been remodelled with modern alternatives or replicas. If you are restoring any old house and find that there is original ironmongery remaining, chances are it will be very rare and valuable, so should be retained and restored as far as possible. If you need to replace ironmongery on this age of property, you should try to find a specialist who can craft your hardware using the techniques of yesteryear to ensure as authentic a finish as possible. 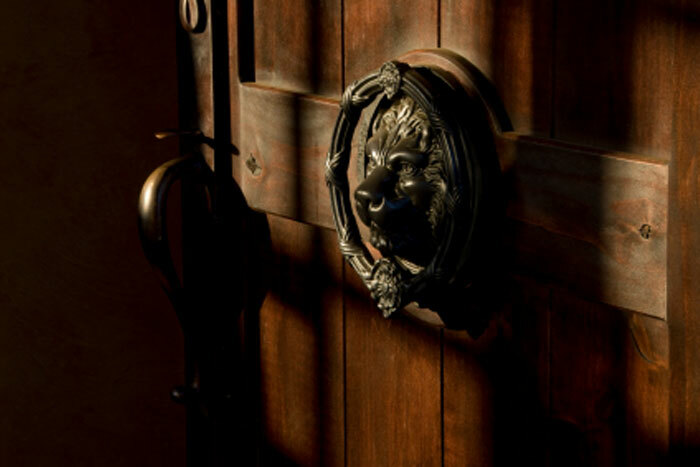 Early ironmongery was forged by hand, often by blacksmiths, out of wrought iron. Due to its handmade nature, each piece of hardware was unique although many followed some basic styles and patterns. Door furniture was usually a thumb latch on a flat iron backplate, which was secured by a large stock lock. Additional security was usually provided on main doors with chunky iron bolts. As well as this, care and consideration needs to be given to the rest of the door furniture. Numerals on the door were usually small brass plates using Roman or Arabic characters. Nameplates were usually brass with incised lettering and secured to the backplates of the bell pull to the side of the door. External door handles and knockers tend to vary from one area to another. For example, the Edinburgh handle is a typical design of the Scottish city, which features a raised rectangular backplate with a rectangular drop handle. Consult your local preservation society or local authority for advice on this. Styles of architectural ironmongery vary from one period to another and can also vary with the location of the building, so take some time to check the history books and see what the most appropriate styles are for your restoration. It’s worth saving a good budget for these finishing touches so you can use professional experts to craft your hardware and don’t be afraid to mix the modern with the traditional if it gives you a better finish. Sometimes using stainless steel bolts or other modern materials can help you achieve the security standards you require whilst still leaving room for a traditional finish and sympathetic design to complement the building.